The aboriginal populations that were located in the province of Herrera were: the “Cacique Paris”, The “Cacique Pesé”, “Monagre”, etc. It is located in the Province of Herrera, in the coastal zone of the Gulf of Parita, covers a surface of 8,000 hectares, of which 3,000 corresponds to the marine ecosystem, 3,500 to an albino zone semidesert and 1,500 to an area of fragmented floors. Inside its limits you can find the oldest pre-Colombian native settlement of Panama, around 9,500 to 7,000 years BC (Cook, 1983). In Sarigua is easy to find objects of ceramics and appliances of stone that are objects of study by scientists of diverse parts of the Continent. The process of salinizing of grounds of the Park has formed a desert landscape of singular characteristic in this part of the American tropic. The Park possesses in its section coastal, forests of mangrove swamps that are the ideal habitat for the reproduction of shrimps and other marine species. Since the City of Panama by daily air mail, in 35 minutes to the City of Chitre in the Province of Herrera and since there to Parita. In car, also from Panama, through the Pan-American Highway to the Parita town in four hours, from there the access road to the Park is taken, passable all the year and that with duration of 15 minutes will carry it to the Center of Visitors. National historic monument of the province of Herrera. The church of Parita with its altars and its pulpit of an ornate style. It is the unique colonial church of the country that still keeps old-fashioned of wood carved of the 17th century; it is a matter of the altarpieces which point out the adoration of the Holy Heart of Jesus and the Virgin of the Candelaria. Also, the altarpiece of San Jose and the main altarpiece, the Immaculate Conception. The colonial church of Parita keeps among its liturgical assets, collections of the sacred art of the Hispanic period. By means of law 35 of November 30, 1920, it is declared national historic monument. This is the Colonial Church of Parita. 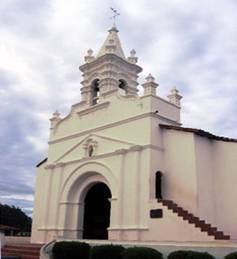 There are many historic churches on the Azuero Peninsula. The old world architecture is well preserved in modern Panamanian culture. So when looking for real estate or property in Panama, and the Azuero Peninsula take time to sight see. The rich cultural history will astonish any visitors. This museum this located in the sacristy of the church of Santo Domingo of Guzman, declared national historic monument by means of law 68 of 1941. Its office hour is from Tuesday to Saturdays from 9:00 a.m. to 12:00 p.m. and from 2:00 p.m. to 5:00 p.m., and Sundays from 9:00 a.m. to 12 a.m., remains closed the Monday and the holidays. 8. Also, the furniture exposed shows pieces of doubtless merit. The museum of Herrera: The museum of Herrera is located in the corner of Manuel Mª. Correa Avenue and July Arjona Street set against the plaza of La Bandera, in the city of Chitré, capital of the province of Herrera. In the ground floor of the building, the room of archeology is found that keeps diverse objects of the pre-Colombian epoch of our provinces. In this room we will find a great theorem on the life zones of the Herrera region. Then it is initiated a trip through by the prehistory of the central provinces of the Isthmus of Panama. Archaeological evidences of the first settlements in the coclesana-azuerense are exhibited. In the high floor the room Herrera is located, where reference is made to the General Tomas Herrera. Also stands out the creation of the province in 1915. The ethnography and folklore room with the groups of the region of Azuero, their customs, relations, and typical customs. The room of the history of Chitré, capital of the province of Herrera, has its historic elements, crafts and local industries, the religious aspect, the fine arts, valuable photographs of the past of Chitré.